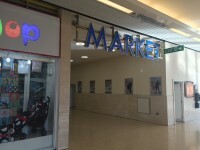 Welcome to The Mall Luton, Bedfordshire's premier shopping centre We've got lots of high street names including Debenhams, Boots, Marks and Spencer, WH Smith, River Island and many more plus a large selection of unique, independent stores. This venue is situated in Luton. The nearest mainline station is Luton. The Mall is open on Bank Holidays between 10:00 and 17:00. You are on Parking (Central Car Park). Skip to the next section. 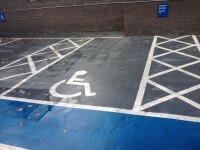 There is/are 15+ Blue Badge parking bay(s) within the car park. 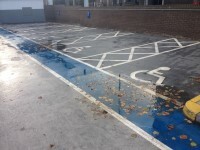 The dimensions of the Blue Badge parking bay(s) are 360cm x 550cm (11ft 10in x 18ft 1in). The nearest Blue Badge bay is 5m (5yd 1ft) from the lift. The furthest Blue Badge bay is 50m (54yd 2ft) from the lift. There is one more similar car park at the side of the venue, called Market Car Park, which is still accessible by lift. You are on Parking (Library Road Car Park). Skip to the next section. The car park is at the side of the venue. There is/are 6 designated parking bay(s) within the car park. 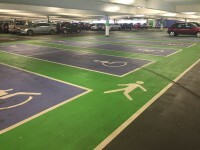 The dimensions of the designated parking bay(s) are 400cm x 600cm (13ft 1in x 19ft 8in). The nearest designated bay is 50m (54yd 2ft) from the Atrium entrance. 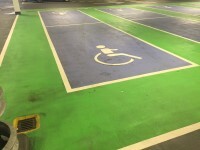 The furthest designated bay is 65m (71yd 3in) from the Atrium entrance. You are on Shopping Centre Entrances. Skip to the next section. Atrium Entrance - There is level access to this entrance. 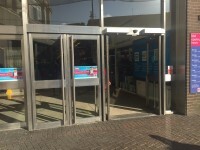 The entrance is a double width, automatic door and is 140cm wide. This entrance is located on St Georges Square. Bute Street Entrance 1 - There is level access to this entrance. This entrance is located on Bute Street. Bute Street Entrance 2 - This entrance does not have level access. There are 15+ medium steps, with handrails leading to the entrance. The entrance is a double width automatic door and 140cm wide. 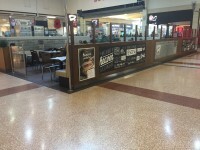 Church Street Mall Entrance - There is level access to this entrance. 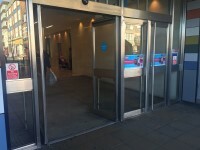 The entrance is a double width automatic door and is 140cm wide. This entrance is located on Church Street. George Street Entrance 1 - There is level access to this entrance. This entrance is located on George Street. George Street Entrance 2 - This entrance does not have level access. 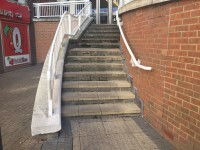 There is a steep ramp that bypasses steps, with handrails to the left, leading to the entrance. 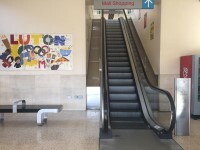 Luton Mall Entrance - There is level access to this entrance. The entrance is a double width heavy, manual door and is 140cm wide. 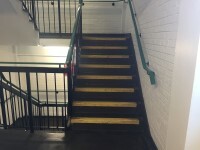 The floors which are accessible by stairs are G-M-3-4-5. 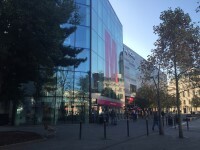 The lift is located at the side of the venue. The floors which are accessible by this lift are G-M-3-4-5. The lift is 5m (5yd 1ft) from the Church Street Mall Entrance. The dimensions of the lift are 150cm x 110cm (4ft 11in x 3ft 7in). 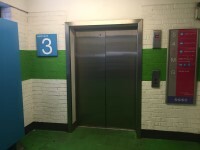 There are four more sets of similar lifts located by the Melson Street, Central Square, Bute Square and the Atrium entrances. You are on Accessible Toilet (Church Street Mall). Skip to the next section. This accessible toilet is located to the right as you enter the venue from the Church Street entrance. 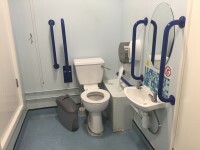 The dimensions of the accessible toilet are 140cm x 270cm (4ft 7in x 8ft 10in). The height of the toilet seat above floor level is 55cm (1ft 10in). There are two more sets of similar toilets, one of which the transfer space is on the opposite side. 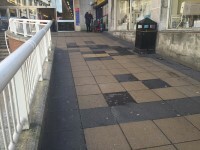 These toilets are located in Bute Square. You are on Accessible Toilet (Central Square). Skip to the next section. 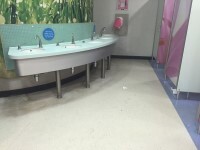 This accessible toilet is approximately 30m (32yd 2ft) from the George Street entrance. This accessible toilet is located down the corridor and to the right, at the rear of central square. 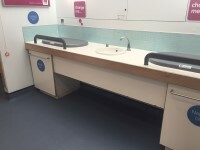 The dimensions of the accessible toilet are 250cm x 190cm (8ft 2in x 6ft 3in). The lateral transfer space is 200cm (6ft 7in). The female and male toilets are located to the right as you enter the venue from the Church Street entrance. The female and male toilets are 10m (10yd 2ft) from the lift. Baby change facilities are located in the middle of the venue. 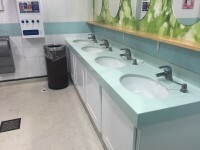 There are two more sets of similar toilets located in Central Square and Bute Square.